Campaign 2016 • After trailing in GOP convention, the incumbent flips the outcome in primary election. Chris Detrick | The Salt Lake Tribune Overstock Chairman Jonathan Johnson talks with supporters during his campaign party in Millcreek on Tuesday, June 28, 2016. His wife, Courtney Johnson, is at his side. Gov. Gary Herbert is the victor in his primary fight for the Republican Party's nomination against Jonathan Johnson, according to incomplete unofficial election results Tuesday. Chris Detrick | The Salt Lake Tribune Overstock Chairman Jonathan Johnson talks with supporters during his campaign party in Millcreek Tuesday June 28, 2016. His wife Courtney Johnson is at his side. Gov. Gary Herbert is the victor in his primary fight for the Republican Party's nomination against Overstock chairman Jonathan Johnson, who mounted an insurgent libertarian assault on the conservative incumbent, according to incomplete unofficial election results Tuesday. Chris Detrick | The Salt Lake Tribune Overstock Chairman Jonathan Johnson talks with supporters during his campaign party in Millcreek on Tuesday, June 28, 2016. Johnson conceded the Utah gubernatorial election to Gov. Gary Herbert on Tuesday night. Chris Detrick | The Salt Lake Tribune Overstock Chairman Jonathan Johnson talks with supporters during his campaign party in Millcreek Tuesday June 28, 2016. His wife Courtney Johnson is at his side. Gov. Gary Herbert is the victor in his primary fight for the Republican Party's nomination against Overstock chairman Jonathan Johnson, who mounted an insurgent libertarian assault on the conservative incumbent, according to incomplete unofficial election results Tuesday. Chris Detrick | The Salt Lake Tribune Overstock Chairman Jonathan Johnson talks with supporters during his campaign party in Millcreek Tuesday June 28, 2016. His wife Courtney Johnson is at his side. Gov. Gary Herbert is the victor in his primary fight for the Republican Party's nomination against Overstock chairman Jonathan Johnson, who mounted an insurgent libertarian assault on the conservative incumbent, according to incomplete unofficial election results Tuesday. Chris Detrick | The Salt Lake Tribune Overstock Chairman Jonathan Johnson talks with supporters during his campaign party in Millcreek on Tuesday, June 28, 2016. Johnson conceded the Utah gubernatorial election to Gov. Gary Herbert on Tuesday night. 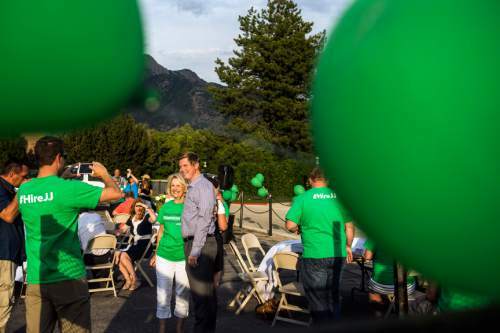 Chris Detrick | The Salt Lake Tribune Overstock Chairman Jonathan Johnson walks through his campaign party in Millcreek on Tuesday, June 28, 2016. Johnson conceded the Utah gubernatorial election to Gov. Gary Herbert on Tuesday night. Chris Detrick | The Salt Lake Tribune Overstock Chairman Jonathan Johnson poses for a photo with Dorothy Bryson during his campaign party in Millcreek on Tuesday, June 28, 2016. Johnson conceded the Utah gubernatorial election to Gov. Gary Herbert on Tuesday night. 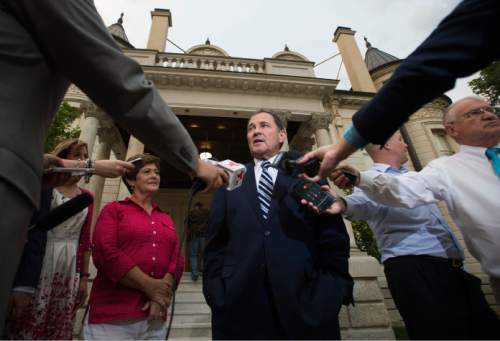 Steve Griffin | The Salt Lake Tribune Gov. Gary Herbert won his Republican gubernatorial primary election Tuesday, June 28, 2016. The governor defeated Overstock Chairman Jonathan Johnson. Steve Griffin | The Salt Lake Tribune Gov. Gary Herbert and first lady Jeanette Herbert are joined by Lt. Gov. 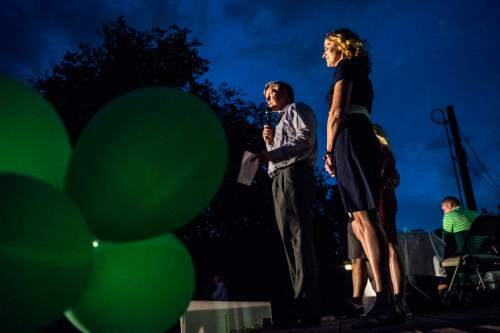 Spencer Cox and Abby Cox as they address the media to discuss their primary election victory on the western steps of the Governor's Mansion in Salt Lake City on Tuesday, June 28, 2016. 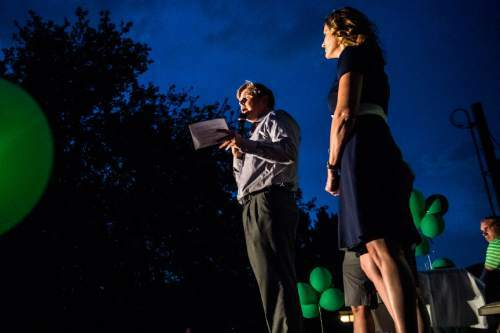 Chris Detrick | The Salt Lake Tribune Overstock Chairman Jonathan Johnson talks with supporters during his campaign party in Millcreek on Tuesday, June 28, 2016. Johnson conceded the Utah gubernatorial election to Gov. Gary Herbert on Tuesday night. Steve Griffin | The Salt Lake Tribune Gov. Gary Herbert won his Republican gubernatorial primary election Tuesday, June 28, 2016. The governor defeated Overstock Chairman Jonathan Johnson. 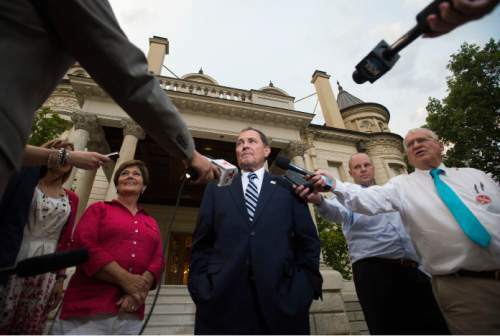 Steve Griffin | The Salt Lake Tribune Gov. Gary Herbert won his Republican gubernatorial primary election Tuesday, June 28, 2016. The governor defeated Overstock Chairman Jonathan Johnson. Steve Griffin | The Salt Lake Tribune Gov. 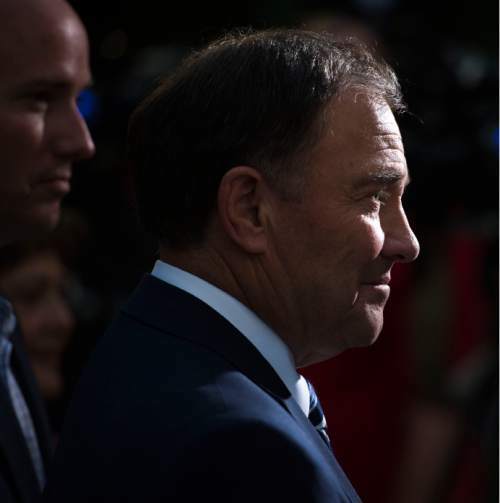 Gary Herbert won his Republican gubernatorial primary election Tuesday, June 28, 2016. The governor defeated Overstock Chairman Jonathan Johnson. Gov. 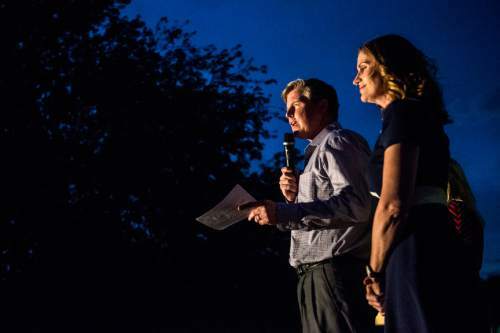 Gary Herbert was the clear victor in Tuesday&apos;s primary fight for the Republican Party&apos;s nomination against Overstock chairman Jonathan Johnson, who mounted an insurgent libertarian assault on the conservative incumbent. The incumbent governor led throughout the night, according to unofficial returns, holding an insurmountable 72 percent to 28 percent lead over Johnson. Herbert told reporters Tuesday night that he was "feeling very gratified" by the win  he called the margin "stunning"  and that his message "resonates with the people of Utah." "We&apos;re humbled about the opportunity to take the next step. This is not over. We have a general election," Herbert said. "We&apos;re very grateful for the success that we&apos;ve had tonight." Johnson called Herbert on Tuesday night to congratulate him on his victory. "If the campaign failed, it&apos;s my fault, but we have changed the discussion in Utah," Johnson said. 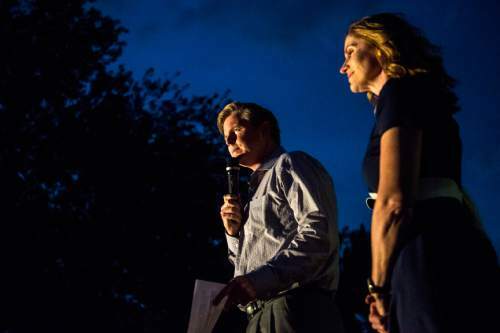 Now, Johnson said, people, including Herbert, are talking about the overreach of the federal government, a lawsuit asserting the state&apos;s right to own more than 30 million acres of federal land and ditching the Common Core education standards. "We&apos;ve done good," Johnson said. "We&apos;ve changed the discussion." He would not rule out running for office again and said he plans to work to get other Republicans elected, including helping Herbert, if asked. A small group of Herbert supporters gathered at the Governor&apos;s Mansion to watch the election returns and celebrate the win. The governor&apos;s grandchildren darted up and down the large wooden staircase. Several dozen Johnson supporters were outside his campaign headquarters in Holladay for a more somber gathering, where gusty winds were causing havoc. 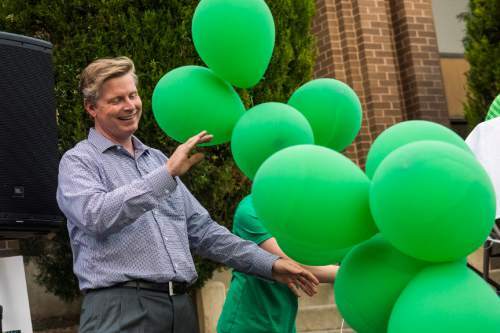 "From the get-go, for Jonathan Johnson this campaign was an uphill battle," said Utah State University political scientist professor Damon Cann. "When you try to unseat an incumbent governor who has approval ratings over 70 percent, it&apos;s going to be a serious challenge." Early turnout in the primary was the highest in 24 years, according to the state elections office, with more than 260,000 Democratic and Republican ballots counted as of Tuesday night before polls had even closed. In November, Herbert will face Democrat Michael Weinholtz, a multimillionaire founder of a medical staffing company and first-time candidate. In a poll conducted for The Tribune and the Hinckley Institute of Politics earlier this month, Herbert was beating Weinholtz 55 percent to 34 percent. Also on the ballot will be Libertarian Brian Kamerath and Independent American candidate Super Dell Schanze. Herbert entered the campaign with the massive advantages of incumbency and hundreds of thousands of dollars in his campaign account. But heading into the Republican state convention, Johnson hammered Herbert for raising taxes, accused him of caving to the federal government on education and lands policies, and beat up the governor for gathering signatures to get on the primary ballot ­ a slight to the nominating convention process. The message resonated with the convention delegates and Johnson upset the incumbent governor, getting 55 percent of the delegate vote  but falling short of the 60 percent threshold needed to clinch the nomination. 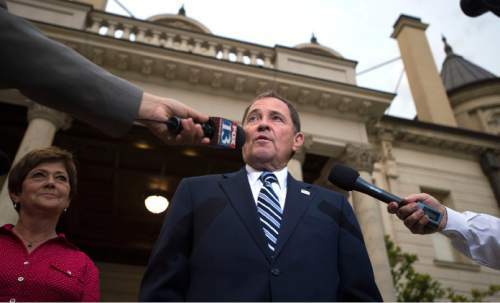 Days after the convention, Herbert also huddled with several dozen lobbyists and supporters, laying out his battle plan for the primary, including an aggressive fundraising strategy that was too aggressive for some in the room. Herbert&apos;s fundraiser told the lobbyists he would do a sort of speed-dating with their clients, giving them 20-minute one-on-one meetings to discuss specific issues if they brought in sizable campaign contributions. One lobbyist questioned the propriety of the plan. Herbert said, in a recording of the meeting, that there was no quid pro quo involved, but when it came time to meeting with donors, he would go anywhere and make time. "I&apos;m Available Jones," Herbert said, referring to a character in the Li&apos;l Abner comic strip who would do any job for a price. Johnson said the governor was engaged in a blatant "pay-to-play" scheme, where wealthy donors got special access and called the arrangement "disgusting." Herbert said he regretted his comments but was trying to emphasize that he was ready to do what he had to do to win the primary. 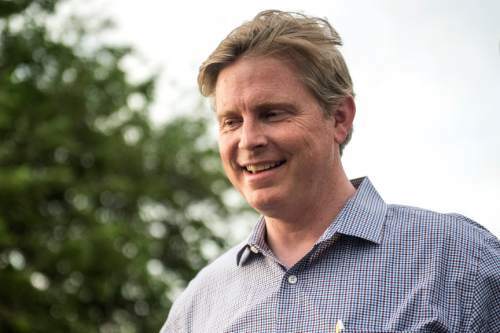 He also questioned whether Johnson was a puppet of Overstock CEO and co-founder Patrick Byrne, who ultimately gave $900,000 to Johnson&apos;s campaign, providing the bulk of the money raised. Johnson said Byrne is a friend and they agree on many issues, but disagree on others and he would not be beholden to Byrne. After Johnson&apos;s concession, Herbert was asked about scars left from the primary. "I&apos;m sure there&apos;s always a little bit of bruised egos and some bumps and bruises from the campaign trail," he said. "But we can see with the overwhelming support, most of the Republicans like what we&apos;re doing and like the outcomes we&apos;re achieving." 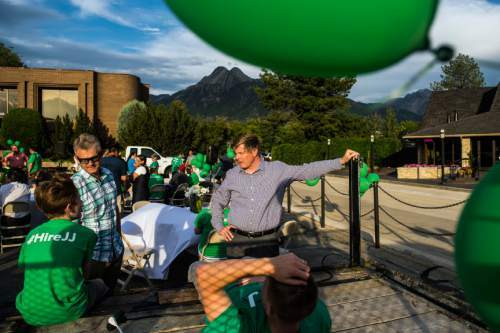 All told, Herbert raised more than $4.4 million for his re-election bid. Herbert also changed course on the state&apos;s Common Core education standards, which Johnson alleged were dictated by the federal government. He was booed at the Utah County convention for defending the standards and, after losing at the state convention, called on the State Board of Education to craft new standards. Johnson&apos;s campaign accused Herbert of flip-flopping on the issue. 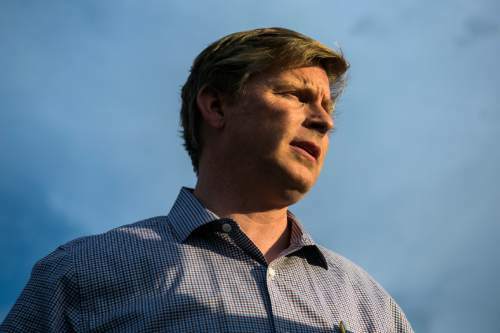 "Pandering and representing [voters] are two sides of the same coin," Cann said. "I think in Governor Herbert&apos;s case, he made a case that voters found compelling and they felt like it was sincere and that&apos;s reflected in the outcome." The two candidates only debated once, a meeting before the state convention. Herbert had assured there would be more debates, but never agreed to any. and said his schedule was too full. Johnson called the governor cowardly for dodging the showdown. 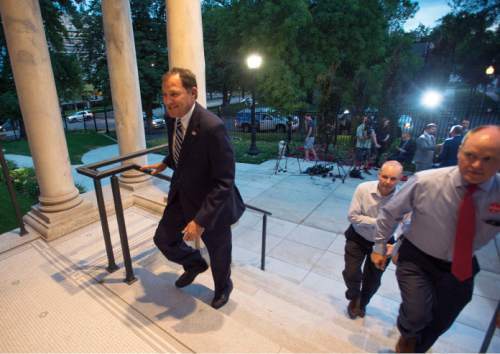 Herbert is looking to become the third governor in Utah history to win election three times. Herbert inherited the office in 2009, when then-Gov. Jon Huntsman resigned to become U.S. Ambassador to China. Under Utah law, Herbert had to stand for election in 2010 and again at the end of the term in 2012  both times winning handily. Democrat Cal Rampton served from 1965 to 1977. Republican Mike Leavitt was elected in 1992, 1996 and in 2000, but stepped down in 2003 to become head of the Environmental Protection Agency under President George W. Bush.